Purpose: To determine the clinical value of membranes in bone augmentation procedures such as ridge augmentation with simultaneous (one-stage) and delayed (two-stage) implant placement, sinus augmentation surgery, ridge preservation and immediate implant placement. Materials and methods: In April 2016, Embase, Medline (Ovid-SP), Cochrane Central, Web of Science and PubMed (as supplied by the publisher) were searched. There were no restrictions regarding language or publication date. Randomised controlled trials that reported membranes in bone augmentation procedures with a minimum follow-up period of 6 months after implant loading or that described geometrical changes of the bone graft at re-entry were included. Membrane placement had to be the only variable in the procedure. Outcomes were implant failure, complications, horizontal bone gain and resorption, graft resorption, defect height reduction, marginal bone loss around implants, aesthetic results and patient satisfaction. The results were pooled using fixed-effect models with mean differences (MDs) for continuous outcomes and odds ratios (ORs) for dichotomous outcomes. Results: After screening the titles and abstracts of 1843 papers, 32 potentially eligible articles were selected. Seventeen articles involving 10 trials were included in this review. These studies presented outcome data for 355 patients. Seven trials were considered to be at a high risk of bias, two at a low risk of bias and one at an unclear risk of bias. Insufficient evidence was found to determine whether there were differences in implant failure rates, marginal bone level changes, aesthetic results or patient satisfaction. For one-stage ridge augmentation (two trials; n = 52), there was evidence of more horizontal bone gain (MD: 0.84 mm, 95% CI: 0.46 to 1.21, P < 0.00001; two trials), defect height reduction (MD: 18.36%, 95% CI: 10.23 to 26.50, P < 0.00001; two trials), and prevention of graft resorption (P = 0.004; one trial) in favour of the membrane-covered group, although substantial heterogeneity was found for horizontal bone gain (Chi2; P = 0.05, I2=74%). There was insufficient evidence to determine whether any differences exist in two-stage ridge augmentation (three trials; n = 81), sinus augmentation (one trial; n = 104) and ridge preservation (one trial; n = 20). 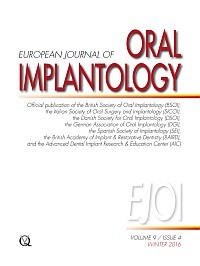 For immediate implant placement (three trials; n = 98), there was evidence of an increased defect height reduction in favour of the membrane-covered groups (MD: 6.25%, 95% CI: 1.67 to 10.82, P = 0.007; two trials), although with substantial heterogeneity (Chi2; P = 0.03, I2 = 79%). More complications were observed when a membrane was used (OR: 2.52, 95% CI: 1.07 to 5.93, P = 0.03; three trials). Conclusions: There is insufficient evidence regarding the effects of membranes on bone augmentation procedures to support any definitive conclusions. Only 10 studies were included; they had limited sample sizes and short follow-up periods, and the majority were at a high risk of bias. However, no difference in implant failure was found, and the possible clinical value is still unknown, as long-term clinical parameters such as marginal bone loss, aesthetic results and patient satisfaction have been insufficiently studied. Conflict-of-interest and source-of-funding statement: The authors declare that they have no possible conflicts of interest. No funding for this review was received. Purpose: To evaluate the safety and clinical effectiveness of a novel dental implant system (GENESIS Implant System, Keystone Dental, Massachusetts, USA) using another dental implant system by the same manufacturer as a control (PRIMA Implant System, Keystone Dental). Materials and methods: A total of 53 patients requiring at least two single crowns had their sites randomised according to a split-mouth design to receive both implant systems at six centres. If implants could be placed with a torque superior to 40 Ncm they were to be loaded immediately with provisional crowns, otherwise after 3 months of submerged healing. Provisional crowns were replaced by definitive crowns 4 months after initial loading, when the follow-up period for the initial part of this study was completed. Outcome measures were crown/implant failures, complications, pink esthetic score (PES), peri-implant marginal bone level changes, plaque score, marginal bleeding, patients and preference of the clinician. Results: In total 53 PRIMA and 53 GENESIS implants were placed. Three patients dropped out but all of the remaining patients were followed up to 4-months post-loading. No PRIMA implant failed whereas four GENESIS implants failed. Only two complications were reported for PRIMA implants. There were no statistically significant differences for crown/implant failures (difference in proportions = 0.080; P (McNemar test) = 0.125) and complications (difference in proportions = -0.04; P (McNemar test) = 0.500) between the implant systems. There were no differences at 4-months post-loading for plaque (difference = -0.54, 95% CI: -3.01 to 1.93; P (Paired t-test) = 0.660), marginal bleeding (difference = -3.8, 95% CI: -7.63 to 0.019; P (Paired t-test) = 0.051), PES (difference = 0.47, 95% CI: -0.56 to 1.50; P (Paired t-test) = 0.365) and marginal bone level changes (difference in mm = -0.04, 95% CI: -0.33 to 0.26; P (Paired t-test) = 0.795). The majority of the patients (46) had no preference regarding the two implant systems evaluated. Three operators preferred GENESIS implants, two had no preference and one preferred GENESIS in medium and soft bone and PRIMA in hard bone. Conclusions: No statistically significant differences were observed between the systems' implant types, although four GENESIS implants failed versus none of the PRIMA type. Longer follow-ups of wider patient populations are needed to better understand whether there is an effective advantage with one of the two implant designs. Conflict-of-interest statement: This research project was originally funded by Keystone Italia, Dental spa (Verona, Italy), the manufacturer of the implants evaluated in this investigation. However, when Keystone Italia received the data of the present manuscript, they refused to honour the financial agreement for the present publication. Therefore, no further follow-ups of this trial will be considered. A legal action was initiated against Keystone Italia. The data belonged to the authors and by no means was the manufacturer allowed to interfere with the conduct of the trial or the publication of the results. Purpose: To test the hypothesis that platform switching and regular platform implants would have different outcomes in single-tooth replacement against the alternative hypothesis of no difference. Material and methods: This study was designed as a randomised controlled split-mouth trial. Eighteen patients with bilaterally missing single premolars or molars to be restored with implant-supported single crowns, were consecutively enrolled. Implant sites were randomly assigned to be treated according to the platform switching concept (PS group), or with matching implant-abutment diameters (RP group). A total of 36 Nobel Replace Tapered Groovy implants were installed. All the implants were inserted in healed bone, with an insertion torque between 35 and 45 Ncm, according to a one-stage protocol. Both implant types were loaded with a screw-retained temporary crown 3 months after implant insertion. Definitive screw-retained single crowns were delivered 2 months later. Outcome measures were implant and prosthetic survival rates, biological and prosthetic complications, radiographic marginal bone level (MBL) changes, pocket probing depth (PPD) and bleeding on probing (BOP). Clinical data was collected at implant placement (baseline), and at 3, 9 and 36 months after loading. Results: No patients dropped out and no implant failed. No prosthetic complications were recorded. One patient experienced mucosal inflammation with positive BOP (RP group) after 3 months, three patients had bilateral peri-implant mucosal inflammation with positive BOP at 6, 24 and 30 months after loading, respectively. There were no statistically significant differences between groups for complications (3/18 versus 4/18; P = 1.0; Odds Ratio = 1.333; 95% CI: 0.3467 to 5.1272). Nine months after loading, the mean MBL was 0.93 ± 0.26 mm in the RP group and 0.84 ± 0.23 mm in the PS group, with no statistically significant differences between groups (mean difference = 0.09 mm, 95% CI: -0.22 to 0.04, P = 0.18). Three years after loading, mean MBL was 1.09 ± 0.31 mm in the RP group and 1.06 ± 0.24 mm in the PS group, with no statistically significant differences between groups (mean difference = 0.02 mm, 95% CI: -0.06 to 0.10, P = 0.70). Marginal bone level changes between 3 years and baseline were 0.72 ± 0.28 mm in the RP group and 0.71 ± 0.27 mm in the PS group, with no statistically significant differences between the groups (mean difference = -0.00 mm, 95% CI: -0.07 to 0.07, P = 0.89). Mean PPD was 2.70 ± 0.52 mm in the RP group and 2.46 ± 0.69 mm in the PS group at 36 months after loading, with no statistically significant differences between the groups (mean difference = 0.23 mm, 95% CI: -0.05 to 0.35, P = 0.43). Mean BOP was 0.83 ± 0.96 mm in the RP group and 0.89 ± 0.99 mm in the PS group at 36 months after loading, with no statistically significant differences between the groups (mean difference = 0.07 mm, 95% CI: -0.03 to 0.17, P = 0.77). Conclusions: The clinical and radiographic outcomes of implants restored according to the platform-switching concept versus implants restored with the matching implant-abutment diameters are comparable, 3 years after loading. Conflict of interest statement: This study was not supported by any company. All authors declare no conflict of interest. Purpose: To evaluate whether 4-mm long dental implants could be an alternative to augmentation with equine bone blocks and the placement of at least 10-mm long implants in atrophic posterior jaws. Materials and methods: Forty patients with atrophic posterior (premolar and molar areas) mandibles having 5 to 6 mm bone height above the mandibular canal and 40 patients with atrophic maxillae having 4 to 5 mm below the maxillary sinus, were randomised according to a parallel group design to receive one to three 4.0 mm-long implants or one to three implants, which were at least 10 mm long, in augmented bone at two centres. All implants had a diameter of 4.0 or 4.5 mm. Mandibles were vertically augmented with interpositional equine bone blocks and resorbable barriers. Implants were placed 4 months after interpositional grafting. Maxillary sinuses were augmented with particulated porcine bone via a lateral window covered with resorbable barriers, and implants were placed simultaneously. Implants were not submerged and were loaded after 4 months with provisional prostheses. Four months later, screw-retained reinforced acrylic restorations were delivered, and then replaced after 4 months by definitive screw-retained metal-composite prostheses. Patients were followed up to 4-months post-loading. Outcome measures included prosthesis and implant failures, any complication and peri-implant marginal bone level changes. Results: No patient dropped out. In six augmented mandibles (30%), it was not possible to place implants which were at least 10.0-mm long, therefore shorter implants had to be placed instead. In particular, one mandible fractured and the patient did not want to go ahead with the treatment. One implant of the patient with the mandible fracture from the augmented group failed versus two 4.0 mm implants in two patients from the short implant group. In the maxillae, three short implants failed in two patients versus five long implants in three patients (two long implants and one short implant dropped into the maxillary sinus). Two prostheses on short implants (one mandibular and one maxillary) were placed at a later stage because of implant failures versus four prostheses (one mandibular and three maxillary) at augmented sites. In particular, three patients of the augmented group (one mandible and two maxillary) were not prosthetically rehabilitated. There were no statistically significant differences in implant failures (P (chi-square test) = 1.000; difference in proportion = 0; 95% Cl: -0.13 to 0.13 or prostheses failures (P (chi-square test) = 0.399; difference in proportion = 0.05; 95% Cl: -0.06 to 0.16). At mandibular sites, nine augmented patients were affected by complications versus one patient treated with short implants (P (chi-square test) = 0.003; difference in proportion = 0.40; 95% Cl: 0.16 to 0.64), with the difference being statistically significant. No significant differences were found for the maxillae: eight sinus lift patients versus three patients rehabilitated with maxillary short implants were affected by complications (P (chi-square test) = 0.077; difference in proportion = 0.25; 95% Cl: -0.02 to 0.52). Patients with mandibular short implants lost on average 0.40 mm of peri-implant bone at 4 months and patients with 10 mm or longer mandibular implants lost 0.52 mm. Patients with short maxillary implants lost on average 0.48 mm peri-implant bone at 4 months and patients with 10 mm or longer maxillary implants lost 0.50 mm. The difference was statistically significant in the mandibles (mean difference: -0.12 mm, 95% CI: -0.20 to -0.04, P (ANCOVA) = 0.006), but not in the maxillae (mean difference: -0.02 mm, 95% CI: -0.10 to 0.07, P (ANCOVA) = 0.711). Conclusions: Four months after loading 4.0 mm-long implants achieved similar results, if not better, than longer implants in augmented jaws, but were affected by fewer complications. Short implants might be a preferable choice to bone augmentation, especially in mandibles, since the treatment is less invasive, faster, cheaper, and associated with less morbidity; however, 5- to 10-year post-loading data is necessary before making reliable recommendations. Conflict-of-interest statement: Global-D (Brignais, France) partially supported this trial and donated the implants and prosthetic components; however, data property belonged to the authors and by no means did Global-D interfere with the conduct of the trial or the publication of the results. Purpose: To determine the accuracy of the latest cone beam computed tomography (CBCT) machines in comparison to multi-slice computer tomography (MSCT) and micro computed tomography (micro-CT) for objectively assessing trabecular and cortical bone quality prior to implant placement. Materials and methods: Eight edentulous human mandibular bone samples were scanned with seven CBCT scanners (3D Accuitomo 170, i-CAT Next Generation, ProMax 3D Max, Scanora 3D, Cranex 3D, Newtom GiANO and Carestream 9300) and one MSCT system (Somatom Definition Flash) using the clinical exposure protocol with the highest resolution. Micro-CT (SkyScan 1174) images served as a gold standard. A volume of interest (VOI) comprising trabecular and cortical bone only was delineated on the micro-CT. After spatial alignment of all scan types, micro-CT VOIs were overlaid on the CBCT and MSCT images. Segmentation was applied and morphometric parameters were calculated for each scanner. CBCT and MSCT morphometric parameters were compared with micro-CT using mixed-effect models. Intraclass correlation analysis was used to grade the accuracy of each scanner in assessing trabecular and cortical quality in comparison with the gold standard. Bone structure patterns of each scanner were compared with micro-CT in 2D and 3D to facilitate the interpretation of the morphometric analysis. Results: Morphometric analysis showed an overestimation of the cortical and trabecular bone quantity during CBCT and MSCT evaluation compared to the gold standard micro-CT. The trabecular thickness (Tb.Th) was found to be significantly (P < 0.05) different and the smallest overestimation was found for the ProMax 3D Max (180 µm), followed by the 3D Accuitomo 170 (200 µm), Carestream 9300 (220 µm), Newtom GiANO (240 µm), Cranex 3D (280 µm), Scanora 3D (300 µm), high resolution MSCT (310 µm), i-CAT Next Generation (430 µm) and standard resolution MSCT (510 µm). The underestimation of the cortical thickness (Ct.Th) in ProMax 3D Max (-10 µm), the overestimation in Newtom GiANO (10 µm) and the high resolution MSCT (10 µm) were neglible. However, a significant overestimation (P < 0.05) was found for 3D Accuitomo 170 (110 µm), Scanora 3D (140 µm), standard resolution MSCT (150 µm), Carestream 9300 (190 µm), Cranex 3D (190 µm) and i-CAT Next Generation (230 µm). Comparison of the 2D network and 3D surface distance confirmed the overestimation in bone quantity, but only demonstrated a deviant trabecular network for the i-CAT Next Generation and the standard resolution MSCT. Intraclass correlation coefficients (ICCs) showed a significant (P < 0.05) high intra-observer reliability (ICC > 0.70) in morphometric evaluation between micro-CT and commercially available CBCT scanners (3D Accuitomo 170, Newtom GiANO and ProMax 3D Max). The ICC for Tb.Th and Ct.Th were 0.72 and 0.98 (3D Accuitomo 170), 0.71 and 0.96 (Newtom GiANO), and 0.87 and 0.92 (ProMax 3D Max), respectively. Conclusions: High resolution CBCT offers a clinical alternative to MSCT to objectively determine the bone quality prior to implant placement. However, not all tested CBCT machines have sufficient resolution to accurately depict the trabecular network or cortical bone. Conflict-of-interest statement: There is no conflict of interest to declare. Funding: Fellowship support came from Research Foundation Flanders (FWO) from the Belgian government, and Coordination for the Improvement of Higher Education Personnel (CAPES) program and Science without borders from the Brazilian government. Purpose: To present a retrospective case series of displaced dental implants in the maxillary sinus. Materials and methods: Patients with unintentional displacement of dental implants in the maxillary sinus over a 5-year period who underwent or were candidates for surgical implant removal were included. The patients' characteristics, medical history, clinical and imaging results, and post-removal outcome were retrospectively assessed. Results: Out of 14 patients, 13 underwent surgical removal. In one case the implant spontaneously exiled into the nose before surgery. The timespan between dental implantation and presentation ranged from 3 months to 9 years. Imaging evaluation showed a displaced implant (100%), oroantral fistula (65%), complete opacification of the maxillary sinus (28%), circumferential opacification (21%), isolated maxillary sinus outflow obstruction (7%) and a sinus which appeared normal (43%). Symptoms and signs included nasal obstruction (36%), purulent secretions (36%), facial pain (21%), tenderness on percussion (21%) and foul smell (14%). Two patients (14%) were asymptomatic. Intraoperative inspection of nine sinuses revealed mucosal changes and purulent secretions in 55% of patients. In all cases the implant had migrated from the maxillary sinus floor towards the natural ostium. Endoscopic removal was carried out successfully in all operated cases. All sinuses eventually healed. Conclusions: Migration of displaced implants and mucosal changes may occur over a short period, eventually causing secondary sinusitis. We therefore favour surgical removal. Surgery should be as close as possible to displacement in order to minimise mucosal inflammation and to prevent unnecessary manipulation during surgical removal. Conflict of interest statement: None of the authors report any financial interests or potential conflict of interests. Purpose: To present a series of rare and serious complications associated with endosseous implant therapy. Materials and methods: Five cases of mandibular osteomyelitis emerging in dental implant insertion sites are presented. In three cases, the clinical signs and symptoms of osteomyelitis occurred almost immediately following implant insertion. All cases occurred in patients with stable pre-existing medical conditions. Three of the patients were females and two were males, all of whom were in their sixth and seventh decades of life. Results: Clinical symptoms such as pain and local infection were observed in all cases, despite long-term antibiotic treatment. All cases underwent progressive surgical treatment including corticotomy, saucerization, sequestrectomy and drainage. Two cases exhibited spreading of bone infection in the mandible which required segmental mandibulectomy and fixation using reconstruction plates. The symptom-free state was only achieved following surgical intervention and antibiotic treatment in four patients. A minimal follow-up of 1 year revealed complete resolution of the infection and symptoms in four out of five patients. The outcome of the fifth patient is unknown. Conclusions: Osteomyelitis related to dental implants is a rare and serious complication. Prolonged antibiotics at high dosage together with aggressive surgical treatment is required. Increasing the awareness among dental surgeons and maintaining correct surgical principles are essential in order to reduce the risk of osteomyelitis. Conflict of interest statement: We have no conflict of interests to report. This section presents a brief review of articles on dental implants considered to be of special interest to the reader in order to encourage the development of research, the interest in data analysis, and the attention to scientific publications. Your comments are welcome. Please contact Dr Michele Nieri at: michelenieri@gmail.com.